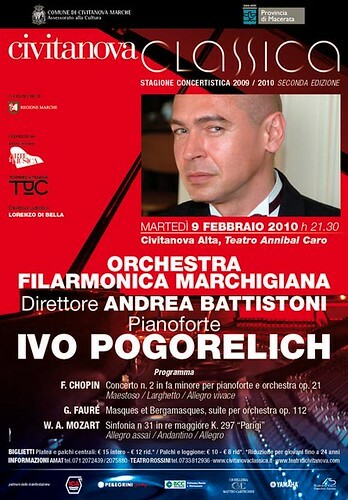 Ivo Pogorelich - Civitanova Marche (MC) - 9 febbraio 2010, originally uploaded by laprimaweb.it. Dorian Gray has grown up. The ponytail is gone, now his hair is shorn short as a soldier's. Ivo Pogorelich (47) – Croatian pianist of world standing, born in Belgrade, packed off to Moscow at the age of eleven to practice the piano for ten years – was the classical music icon of the eighties after not winning the 1980 International Chopin Competition in Warsaw. Martha Argerich quit the jury in protest. He himself fuelled his dizzy career with provocative statements and a bird-of-paradise image. Old and young alike flocked to his concerts, his records were bestsellers. Critics love or hate him, there's no middle ground. When his wife and teacher Aliza Kezeradze, 21 years his senior, died in 1996, he withdrew from the public eye, appearing only for rare – and often eccentric – solo evenings. Pogorelich, who knows nothing of iPods or Lang Lang, now lives in Lugano and designs jewellery for fun. On August 27 and 31 he performed with the Thuringia Youth Orchestra at the Weimar Arts Festival, playing Rachmaninoff's Piano Concerto No. 2 and Prokofiev's Concerto No. 3. Die Welt: You and Franz Liszt are only three links apart in a chain of students. Was that one reason for you to work in Weimar, with all its connections to Liszt? Ivo Pogorelich: Yes, isn't that unbelievable? And going back to Beethoven I'm number seven in the same chain. All that was only possible because of the Czar. He helped Anton and Nikolai Rubinstein to open the Russian piano school at the conservatories they founded in St Petersburg and Moscow. The Czar acted like the sheikhs in Dubai do today. He wanted only the creme de la creme. That's how Czerny's student Theodor Leschetizky came from Vienna to St Petersburg. But Liszt himself was there too. It's like a triangle for me. I helped finance the renovation of classroom number nine in the St Petersburg conservatory, where one of my "predecessors" taught. And during the Second World War one of the students there was sent to Georgia, where she then taught my wife. So Weimar closes a circle for me. And in Nike Wagner as artistic director you also have a real descendant of Liszt there. She's charming, despite her sharp tongue. But she needs that in her position. But what are you doing there as a pianist with an orchestra? I try to pass on to them something of my take on music. It is always interesting for me to confront impressionable young people with my views. They are individuals who still have to be melded into a single sound. Under those circumstances I have no problem working with an orchestra, something I hardly ever do otherwise. It bores me. Especially these American orchestras with their union rules. When I recorded Chopin's Concerto No. 2 with Claudio Abbado in Chicago, a woman suddenly held up a watch – thirteen seconds before the end of the last movement – and had the recording stopped. I got terribly angry, screamed who do you think you are, doing something like that? Get out immediately, I don't want to see you ever again! Even Claudio looked scared. But the world had great expectations of you and Abbado. I liked him very much. He is the most modest conductor of them all. He's someone who really listens. Yes, really I should give it another try with him... Or with Gustavo Dudamel, Martha Argerich recommended him most warmly just recently. I've always tried to support young performers, because in my privileged position I wanted to reinvest something for the future, even when I was still young myself. When I was 22 I wanted to show my thanks, but that was largely a financial commitment. Since giving public master classes for pianists in China, Taiwan and Athens last year, I have also started enjoying being involved myself. And now you want to break your long silence in the recording studio? In my house, on a hill above Lugano, I'm going to start this autumn with preparations for new recordings. The repertoire will be Rachmaninoff pieces and Beethoven sonatas. They will be my first recording sessions in eleven years. For me that is a completely new artistic situation here. I had already left New York shortly before September 11, 2001. And in London it has all got too claustrophobic and unartistic these days. The city is more or less in a state of emergency, and you're under surveillance all the time. That's probably necessary. But it's not for me any more. So that's why Ticino came just perfectly for me. I'm 47 now, and it's the right thing for me. Why are you recording again now? For a long time records were documents by artists. Then it all became commercialised, and much too much was recorded. Now the market has regulated itself. All that's produced is what people really want and buy. CDs aren't a career treadmill any more, just the by-product of a live career. I feel I have a role to play again – although I was never someone who recorded too much. All my records are still doing very well, they never disappeared from the catalogues. But recording means responsibility too. Why have you kept quiet for so long? For many reasons. I changed my technique. I wanted to go right back to my roots. In that time I got sick, and then my wife died. So I needed a lot more time. I wanted to have time and space, for myself, for my concepts. I learnt a lot, about things you never hear in public. Like music from other places, Spanish music for example. I also learnt Spanish, and wrote Spanish poetry. I'm the product of a very thorough and strict education. All my life long. Then I was on my own. Suddenly there was no one there to ask for advice. But I also felt a great deal of artistic freedom. And in this time my interests focused more and more on Beethoven and Rachmaninoff. In two years I'll be 50, and in 2010 I'll have 30 years of international career behind me. That makes you reflective, you want to seek out young people and new challenges. As an artist you're always having to change the spring you drink from. How did you get over your wife's death? I had to reinvent myself. She was so demanding. She clothed herself in art, she absorbed it, devoured it. She was so universal. She had everything, class, education, beauty, talent and affection. She outshone everything like a comet. You could never stand still with her, that's true, she was always on the go. Even in death she was still the princess she was born as. She had cancer of the liver. When she died her liver exploded, and in her last kiss she showered me with black blood. I looked like the phantom of the opera. My hair was completely clotted. I didn't want to wash it off. When they condoled us with champagne I was still covered in her blood. But everyone understood. It was like with Jackie Kennedy who didn't want to change the dress that was spattered with her husband's brain. I was happy so early in my life, I knew now I would have to stand on my own two feet. It just took a long time. On the contrary. I couldn't touch the piano because my memories flooded out like Niagara Falls. It took time before I could be creative again. Before, proposals and solutions had been offered to me like jewels on a silver tray. Aliza knew I could do that myself too. But I needed time, because she had shaped me the way you sharpen a knife every day. When Aliza came into my life I was 17 and at a dead end with my piano studies. I wasn't getting anywhere, I wanted to dance but wasn't even able to walk. What do you think today when you hear words like "eccentric", "arrogant", "difficult"? That was my image. I worked on it myself like a child making a toy. That was the price a 22-year-old had to pay to make an awful lot of money. People are always after the "dark power," like in Star Wars. Why? It makes it easier for them to accept an exceptional person. That way they could forgive me my success. I began with a scandal, and my rise to intercontinental fame went hand in hand with the explosion in the media. Of course it was never my goal in life to be involved in creating an image. And I've also seen how apparently perfect, scandal-free careers have their ups and downs. Do you like your audience? I respect them. I don't have to like them, do I? But I need them. After just a few seconds in a hall I can feel what kind of vibe there is there. And I can sense how demanding they are. You must never let your concentration drop. If I feel that the programme was full and rounded I don't give an encore. If I feel it wasn't quite perfect this time then I might hammer out a hit like Balakirev's "Islamey". I never wanted to close myself off from other people, become a hermit like Glenn Gould who speaks to the world only through his records – even if I have always sought out nature and solitude to come to peace with myself and my music. I need the dialogue, otherwise you can never move towards your ideal of perfection. You always need to move forward in life. You never get an answer if you only communicate through recordings. What's your frame of mind at the moment? Relaxed. I feel I'm in good physical condition, I'm curious. But I'm not a suitcase you can send on endless tours. I enjoy the luxury of only playing in public when I choose to. After the tour the music isn't any different, but I've changed. I have to remain effective, face the music. And deconstruct it too, even if I'll always be criticised for that. Eleven years ago you predicted in a questionnaire that Germany would get a woman chancellor in 2005. I'd love to meet Ms Merkel. She's very educated, interested in music, and she probably speaks good Russian too.